An "adventure RPG" set in the Old West. Stickman MMO Kingdom of Loathing has been going since 2003, and I'm just going to stop and think about how wonderful that is for a moment. 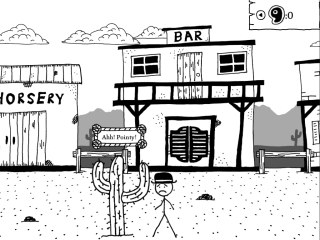 West of Loathing is being described as an "adventure RPG", and you can see what that means in the above video. Basically, it means dialogue, sidescrolling, turn-based battles, comedy, and other exciting things. West of Loathing will be out "Early 2017", so says the Greenlight page, and that's entirely too far away.